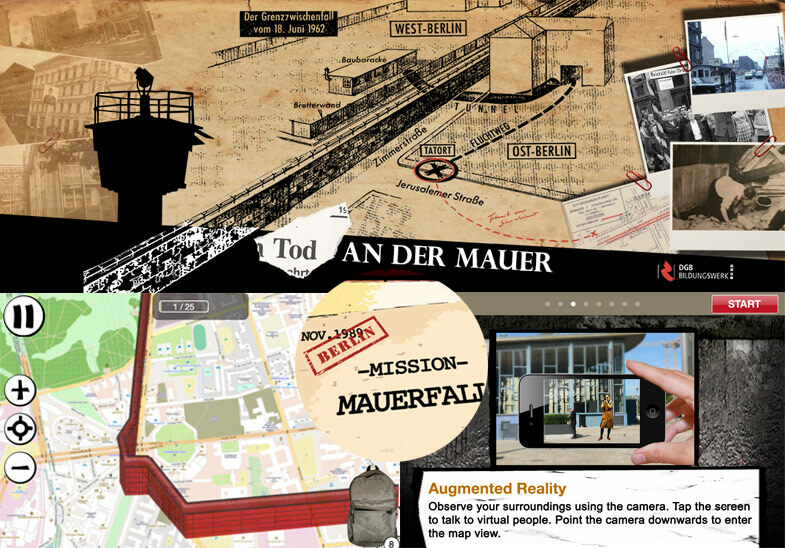 This interesting project mixing locative documentary and gaming around the Berlin’s wall history is using open street map with a 3D modeling of the wall. They also use the Augmented Reality in a very simple and clever way. It is inspiring to connect this project with the Gloucester Harbor Walk from Untravel Media. I believe that in 2014 i will travel to Berlin to test this game and more mobile apps the Sprylab company is building. “June 1963, Berlin – You are a journalist and hunting for the truth, insofar as available in this actual and historic case. Your smartphone will guide you to its real settings and unearth the past. Rudolf Müller is a cross-border commuter from West Berlin. His wife and two children live apart from him in East Berlin. As reuniting the family appears impossible, Müller digs an escape tunnel underneath the Wall. But their escape is overshadowed by a tragic incident: Reinhold Huhn, an East German police officer, loses his life. The reunion of the Müller family becomes a crystallization point for the conflict between East and West.